Happy Friday everyone. Its.....already.....Friday.....again! Wow. So this week between work, yard chores and other things on the must do list, I've had limited art time. I haven't been working on too many projects, basically I focused on 2 of my journals. 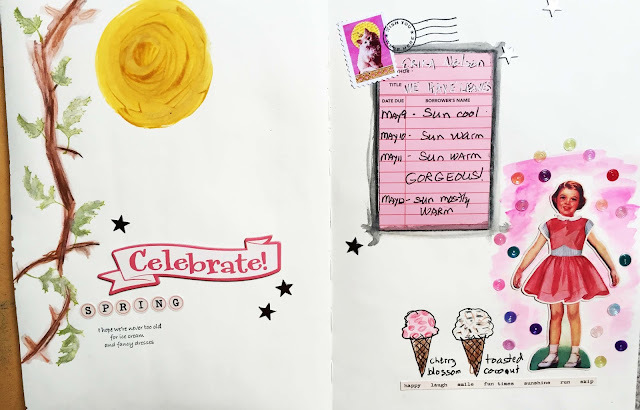 Today I am sharing my personal journal for this spring and summer, what I call my scrap-journal because I am adding photos and bits and bobs, kind of like a scrapbook. But not. I am trying to record life but not document it too closely. I am also doodling, painting and stamping in this journal too. As it is Friday, I am linking up to Paint Party Friday. (Thanks Eva and Kristen for hosting us every week.) I've been kind of bad not following PPF as closely the last few weeks as I usually do, (between weekend yard work and other things), so I hope to be a better participant this week. I'm trying not to make this an all consuming journal, so I create my pages relatively quick. I'm not so concerned with perfect as I am with liking my page and having my page reflect my week/day/thoughts/ideas/etc..
On some pages I am even leaving the background the white page of my journal. My challenge keeping this journal is the battle between my need to be exact and specific (like keeping a diary) versus the call to to be more relaxed and abstract (like keeping an art journal). I also want to add in fun things I come across, like the decorated bathroom signs at Trader Joe's in the spread above this paragraph. 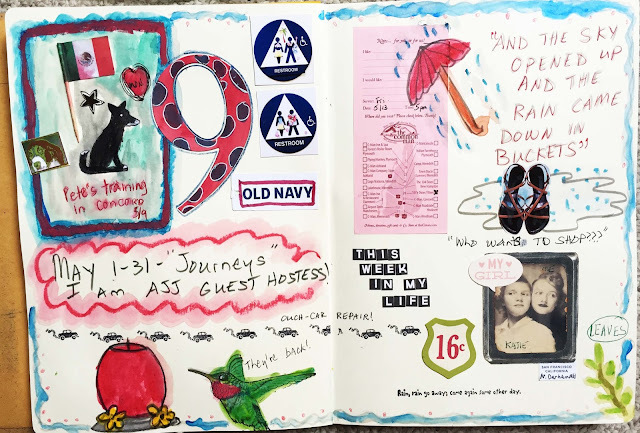 The goal is to make this journal a reflection of the "feel" and memories of spring and summer 2016. But sometimes I seem to combine both and really like the results. This is really a journal for me. But I am curious, if you keep a personal journal, what do you like to do? Happy Friday everyone. Have a great weekend and thanks for visiting. I love all your pages... I adore that you reflect your days this way - that is unique! Happy weekend Erika - enjoy it! my peonies start to burst into bloom.. yeah - they get a beautiful antique pink color --amazing. Seems to be a really good year for peonies... I see so many of them around in the gardens. Those red nails are so summer!! I love the dynamic fell of your art journal pages. They're filled with such wondrous imagery and color. Happy PPF! Love the June banner Erika! And your personal pages are just full of life- I really love them - very eye catching. Happy almost weekend! 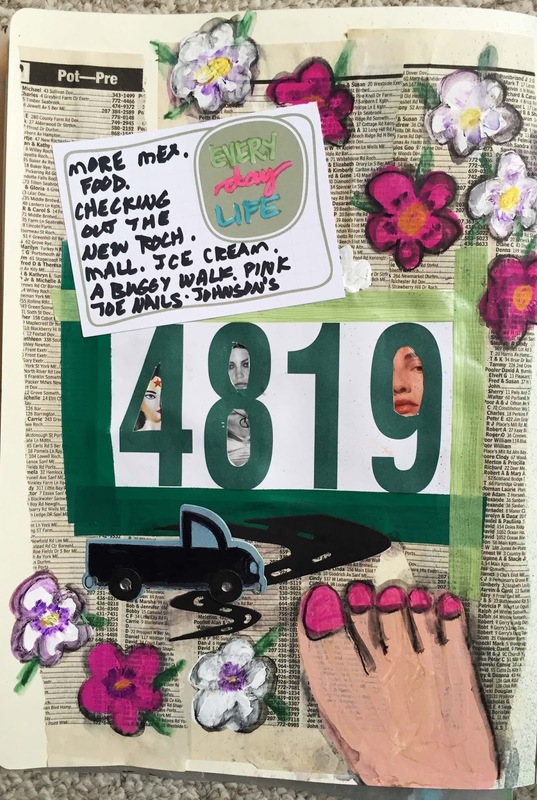 Erika, your journal pages are fun and so well put together. And I love the banner! Very cool! I went back and looked at yesterday entry and loved the photos, especially the one of Harley rolling in the grass. My black lab lived to be almost 15 and used to roll around like that. I called it "itching her back". I shed tears off and on for about 7 or 8 years after her death, missing her so much. What great journal pages! They're so fun and cheerful looking! Wonderful journal pages Erika, full of great images and colours and lots of interest. 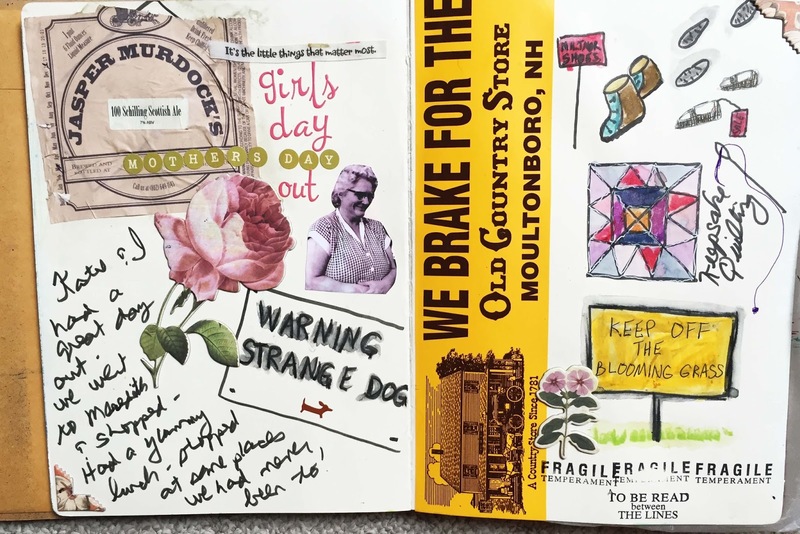 I think these are the best pages, art journalling combined with words and pictures that will remind you later of things you have forgotten. I am saying this, because, to answer your question, I kept illustrated diary-art-journals like this (and still do) and it brings back memories later. Love the pink toes and flowers especially. Also meant to say how much I like your June header - bzzz bzzz bzzz! These look like you have put your heart, soul, and pink toenails in these pages. I think they reflect you PERFECTLY. I don't journal because I don't like to write by hand. I like the combined effort of lovely art and a calendar type record of the events that occur over a given period of time. These are great examples of that! Oh I love your pages...and that foot just makes me soooo happy! I love it! Wow so much fun! Never much of an art journaler...however I do all my art in books now but not with much thought...more intuitive...Nothing is dated and it's all over the place. I think I would have to study my pages to get any meaning out of them. Great job and I am loving your changing banners...thanks for inspiring mine to change monthly too!